Fugly Horse of the Day: He also good with ducks! For those of you who are determined to breed something on a budget - and we know you lurk here! - here's today's selection of fugly, blue-light-special studs for your consideration! I have to credit i_luv_my_horses_17 on the horse.com forum for finding these very special - and I mean that in exactly the short-bus way that you think I do - stallions. Here is an unregistered Mustang...but the price is right! His stud fee is...fifty dollars. Hey, that is more than some of his get will no doubt sell for at the local auction! "Sky is a very calm, good hearted horse.He's not mean at all and he loves to be brushed and loved on.he also good with little kids and little animals such as cats, chicken, dogs, ponies, goats and ducks.Now I have my stallion in with my mare.He's about 15.0 hands, he has a white down the middle of his head and a white sock on the left back ankle." Looking for a bit more spirit? 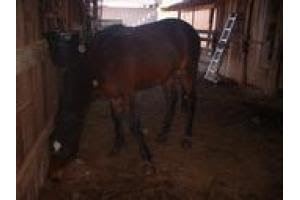 Hey, for only $200, Lola will let you breed to her unregistered Thoroughbred colt. "Young and a little wild,has not been riden yet,we're getting there but a beautiful stallion,has a good temperment." WTF is that fence in the foreground, anyway? He's not fugly but he needs to be a gelding ASAP! You'd be amazed what that would do for his being "a little wild." You might even be able to get him riden eventually. 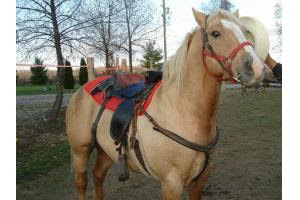 Today's award for most enthusiastic description of a totally mediocre horse goes to this grade palomino stud...Triger. (Folks, I do not make these spellings up!) Why is it they can spell everything except his name? "This golden horse, who was the choice of ancient emperors, kings and queens, the beloved steed in Greek mythology, the subject of artists' canvas, the pride of Queen Isabella's Spanish court, the treasured mount of ancient tribes and companion of the Conquistadors, is still with us today. The palomino was tamed by the Indians of the Southwest, rediscovered by today's horse lover, made a star on the "Silver Screen" and exhibited at horse shows throughout the world. Palomino horses are found among the finest bloodlines of breeds; their appeal is international." Doesn't he look like the back cinch is giving him a wedgie? He really does not look happy! And why is someone holding up a hat to the left side of his face??? 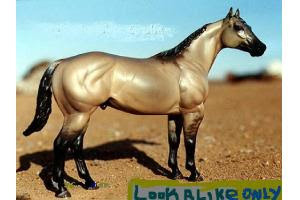 ROTFL here's a solution to keeping the pics of your fugly low-end stallion off this blog...just post a pic of a Breyer model and claim it looks like him! I LOVE how she felt the need to print "look a like only" on the pic. IN CASE YOU WERE CONFUSED AND THOUGHT IT WAS A REAL HORSIE! I am dying here! "The photo is just to get an idea until I have a real pic on here. Poco Skipped Spots is an easy breeder and very easy going. His sires is Black Joe Dee, His dams is Poco Missed Spots. He has covered 12 mares with babys, easy going as he is. The other are dew in 2008. 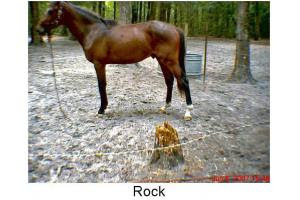 Would trade breeding for a good mare, yearling, or young horses. He has zebra strips on his legs. He has dun marks and very cowie. Has black mane, and tail, also has a stripe down the back. He has alot of poco in his breeding. With no skin probs. I don't have any pics on there yet. Please e-mail with anything you would like to know at poco01stud@yahoo.com You can see his pedigree at www.allbreedpedigree.com Poco Skipped Spots Thanks Jo"
I don't know whether I am more baffled at the idea of mares being dew, or if I should just sit and wonder whether the zebra strips are breaded and deep fried, and if zebra strips are even legal?